Stuart is already in Johannesburg and started his first day at work yesterday. All seems to be going well at the office, but when I got up this morning I found the following emails in my inbox. 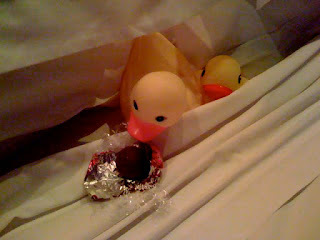 The situation in the hotel room doesn't seem to be quite under control: "I don't think the ducks believe me. I told them you would be coming soon but another day has gone and you are still not here. I think ducks have an attention span problem so that is why they keep nagging me about you. Actually, I think they are a little lonely sitting here all day long with no one to play with and me telling them that you will come and play has got them all excited. I will go and have a bath now and that should shut them up for an hour or two but, honestly, the plaintive quacking is driving me up the wall." Worrying developments. A half hour later the following arrived: Well, things are now getting out of hand. I went and had a bath (just to cheer up the ducks, you know). As sometimes happens on these occasions I fell asleep. I awoke when I heard what can only be described as 'furtive quacking'. So, I get up and look for the ducks. Imagine my surprise when I see that, not only have they climbed into my bed, but that they have also dislodged my chocolate from the pillow, and were just about to eat it! Well, they are now in disgrace - I gave them a serious talking to and put them back in their rightful place on the side of the bath, without supper. 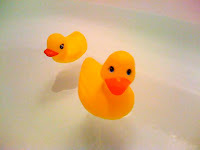 Please come soon and help me control these ADHD ducks - they are driving me bonkers." FYI, the ducks' names are Quacky and Sylvester. I think Sylvester is the brains behind the operation, Quacky is just the muscle. upload the blogger, including photos (preserving the original geotag when the photo was taken,, geotagging of entries andability to add links. editing of all existing blog entries, not just the ones written on the phone. Not so easy after all. I have tried three now and it seems as if I am stuck using multiple apps to achieve all those things. Lifecast is great, and free, but only shows me the posts I wrote on the phone. Once I posted, I can edit but end up with duplicate posts. But it let's me upload photos, although not with text. Which is more than I can say for iBlogger, which costs money, but let's me edit posts and re-published them as well has having great tagging support. . No photo uploads to Blogger at all, alas. Promised to come, but who knows when. Lastly there is Shozu, which looked promising, but has an annoying bug that makes it useless: once you bring up the keyboard, it stays there and totally obscures the rest of the post. Otherwise. It would be fab, and free. I haven't bothered with any other blogging app, I figure paying for one is enough and for now I'll make do with using multiples. This so what you get when developers aren't allowed to talk to each other, I guess. My friend S ara curates the Mighty Movie Mash screenings at Mighty Mighty every month. For her second event she asked me to contribute one of my films. I have been thinking about how much I liked my Wellington Portrait, but that it was hard to screen, not having a storyline, and being more of an installation piece than a film. 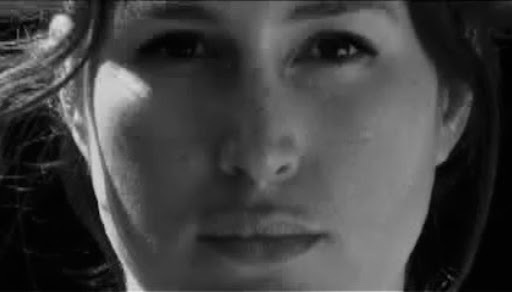 But I thought I would give it another try, since it has only been screened at film school so far. As it turned out, I was right to have doubts. I still love the film, but the venue was all wrong. First of all, the film was bracketed by Leo's short Collaborator and a very slick horror short from the UK, so the audience was totally baffled by this switch in content. Then, since the film has no audio, all the background sounds of a bar and the street outside were very audible (to me, anyway). And lastly the screener had not managed to show the film in full screen from his MacBook, so the time remaining was very visible in the bottom right corner of the screen and made it more of an exercise in waiting till it's over. So the way forward with this piece is to put it in an exhibition space, where the audience expectations are different to a cinema audience. Plus, there I might be able to show the extended 30 minute version. Another idea someone suggested was to film more and make this an extended piece. So I am planning to look into getting film permits in South Africa and Dubai and film more portraits of strangers.